What is the Net Promoter Score®? The Net Promoter Score®(NPS) is a metric based on one simple question: “How likely are you to recommend this business to a friend or colleague?”. Customers are asked to answer this question on a scale of 0 to 10 in a survey. 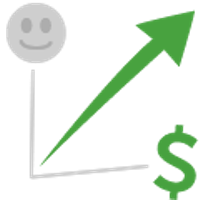 This powerful metric is used across a range of industries to measure customer satisfaction. Based on the response to the recommendation question in your guest survey, the guest is classified as a promoter, passive or detractor. Guests that give a 9 or 10 rating are classified as promoters. They are enthusiastic guests who are happy with their stay. Those that give a 7 to 8 rating are passives. These guests are satisfied but could potentially stay at one of your competitors. Detractors are those that give a 0 to 6 rating meaning they are not particularly satisfied with their stay and most probably wouldn’t book again. How is the NPS® calculated? The NPS® is calculated by taking the percentage of promoters and subtracting the percentage of detractors. Depending on whether customers give low or high scores when asked if they would recommend a brand, the NPS® score can range from -100 to 100. For example, if 68% of customers were promoters and 13% were detractors, then the brand’s NPS® would be positive (55). If on the other hand only 21% of customers were promoters and 57% were detractors, then the brand’s NPS® would be negative (-36). Why is it useful to measure this metric? Measuring the NPS® allows you to monitor evolution of guest satisfaction over time at your hotel. If you are a group of hotels, you can compare the performance of individual properties against each other. You will also be able to see the impact any recent changes have had on guest satisfaction, such as a renovation at your property. How can you turn insight into action? By implementing this question into your Guest Survey, you can use your guest feedback and NPS® to gather the necessary insight to take action. For example, segment your detractors and put some service recovery into place and ensure your hotel manager follows up with the guest after negative feedback. Passives are potential promoters so you can reach out to them to find out what you need to do to turn them into promoters. Promoters are your hotel’s biggest asset, so make sure you engage with them to encourage them to become loyal guests. For example, why not email to ask if they want to join your loyalty programme. Set goals within your organization and empower your team to improve NPS®. How can you improve your hotel’s NPS®? Gather guest feedback at your property in order to make operational and service improvements and deliver better overall experiences. Guest Intelligence empowers hotel professionals to change internal culture and processes in order to increase guest satisfaction, your NPS® score and in turn, your revenue.